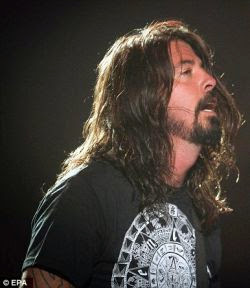 The Foo Fighters yesterday made the first of their four shows in Brazil in Porto Alegre in the parking lot of FIERGS. The band played 26 songs, complete with two covers of Queen. As this was the third show of the band in South America, after shows in Chile and Argentina, it is possible to see a pattern in the performance. In the first part of the setlist they played 15 or 16 songs divided between new songs ("something for nothing", "Congregation") and hits ("Learn To Fly", "Monkey Wrench", "My Hero"). The second part took place in Stage B, mounted in the audience. At this point in addition to playing "Times Like These" FF paid tribute to some bands that influenced them. Gauchos then heard Kiss music ("Detroit Rock City"), Rolling Stones ("Miss You") and two of Queen’s songs - "Under Pressure" and, before that, "Tie Your Mother Down", which were played for the first time on this leg of the tour. The show then ends with a long encore with several hits - "All My Life," "Best Of You" and "Everlong" between them. This part also had a novelty as "Rope" was another song performed for the first time. The Foo Fighters will also perform in São Paulo (Friday, 23, at Morumbi Stadium), Rio de Janeiro (25, Maracana) and in Belo Horizonte (Wednesday, 28, in legume Esplanade). Kaiser Chiefs will open all shows for FF.